The multitude of games available at Kitty Bingo will have you purring with satisfaction. You just might need 9 lives to experience all they have to offer. This kitty cat themed online bingo site launched in September of 2012 paving the way for its sister site Lucky Pants Bingo. The two sites are basically mirror images of each other featuring the same software including Daub Games, Play’n Go, Mircogaming, Bally Technologies, IGT, NextGen, Eyecon, GECO Gaming and exclusive proprietary games. 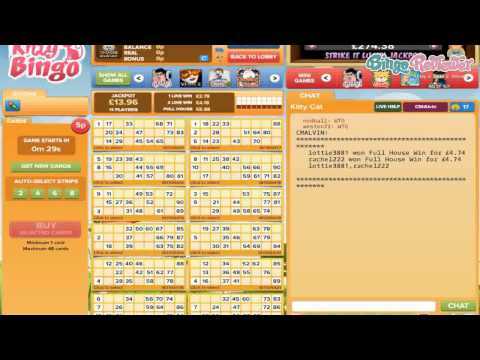 If players recall playing bingo at Spin and Win, the site eventually began directing its bingo players to Kitty Bingo. This was the first glimpse we got of the site featuring adorable kitties and tom cats roaming around in colors of pink, purple and yellow. Players can access games via Instant Play. There is no download required to play bingo or any of the casino games available in the multi-software platform. Bingo games are available in 75-ball and 90-ball variations. Kitty Bingo offers a great range of Slots, some of which include progressive jackpots. Choose from titles such as Lady Luck, Quick Hit Pro, Easter Eggs, Gemix, Money Bunny, Shadow Diamond, Golden Ticket, Flutter Pays, Crazy Cows, Sumo Kitty, Cash Wizard, Pimped, Jewel of the Dragon, Jackpot Vegas Hits, Golden Goddess, Cleopatra, Shaman’s Dream, Kitty Glitter, Thunderstruck II, Cashapillar and many more. If it’s more you want, it’s more you’ll get with Roulette, Card Games and Scratch Cards like Kitty Slinger, Kitty Grabber, Aqua Lotto, Cash Clown, Ice Fishing and Holy Cow. New players are treated to a Welcome Bundle including a deposit bonus plus a round of free spins on a selected Slot Game. Keep your eye on special bonus days like the 2nd and 3rd deposit bonus and the Bonus Booster on Thursdays. Additional promotions include cashback for life, free bingo, jackpot bingo, mystery bonuses, BOGOF card specials and much more. The Kitty Club rewards program has 6 levels of status from Newbie to Bronze, Silver, Gold, Ruby and Emerald. Starting with the Bronze level, each offers exciting benefits including cashback for life, Birthday Bonuses and a faster withdrawal process. The payout percentage is available on every game giving players a heads up on the loosest games. There’s always a daily, weekly or special promotion to keep players engaged. Withdrawal limits are quite low with a maximum of £3,000 per month; however players may contact the payments department to request a larger withdrawal. We rate Kitty Bingo with 4 Pink Hearts. Here, kitty kitty! I've been hearing a lot lately about Kitty Bingo. After a trip to their site, I can see what the big meow is all about! From the moment you sign up you are met with gifts and excitement. You get £10 FREE when you register and they don't require a deposit for you to try out Kitty Bingo. With Christmas coming you know they have gifts for you. With their 31 days of Xmas promotion, you can be gifted every day at 8:30 pm playing only 5p per card. And for New Year's, you can win a Brand New Beetle to kick off 2012. "At Kitty Bingo the milk never gets sour" is their slogan for the up to 15% Lifelong Cash Back promo you get once you sign up at the site. You also will get double your first deposit and 50% bonus on all of your redeposits. All this and more is to be found every day at Kitty Bingo, and I've got to say the site is full to the brim with warm fuzzy delights. Enjoy a game of Kitty Bingo today. You have a great chance to win! The weekend Promos are great at this site and always something to look forward to. They give away a lot of Kitty points and that can be a good towards moving to new VIP levels. Some of the promotions give away literally thousands of Kitty Points and for every 1,000 earned it is worth £1 real cash. I would like to make to the Emerald level by my birthday for the £100 Birthday Bonus. Kitty Bingo is hard to miss and they must have a very strong marketing team because they are on top of google search almost every time i do a bingo search. The software is Microgaming and IGT and that is a powerful combination of games in my opinion. They offer a great variety of Slots too and i love the Slot Tournaments on Mondays. The promotions give the other sites a run for their money because you can't go wrong with Life Long Cashback that is not just a short time deal. I recommend Kitty Bingo to anyone looking for great promos and different software for switch up your gaming style for a change of pace. I have only one slight complaint about kitty bingo. They need to offer more bingo variations! Don’t get me wrong, I love the classics but it’s nice to have an extra one to go to when you’re a little bored of the usual routine. Other than that, they have awesome bingo progressives along with a fabulous welcome offer. It’s unique compared to the ones other sites give away. For joining the site, they give each new player 250 free cards and 10 free spins. It makes things a little more interesting and suspenseful because you don’t quite know what you’re going to get with your free spins! And, on top of that, it’s a no deposit required offer. You can’t beat a deal like that! I also really love their no limits bingo where the jackpot has a chance to keep growing based on the amount of players who are playing any particular game. This is one of those sites that look good and run even better, with the fresh graphics and fast navigation. I am more of a dog person, but who cares with bonuses like those. You get a 300% bonus on your first two deposits, plus 20 free spins, plus 50% reload bonus, and the list goes on, since they have a lot of things going on at the moment. Not a bad place for playing anything from slots and roulette, down to the good old bingo, and even scratch cards are there. I wish that they have something more than just 75 ball and 90 ball games, but sometimes, the classic is all you need. I must say that I like how the games look and feel, smooth and with really nice graphics, so I doubt anyone will have a complaint. They have a nice loyalty program, and the more you play, the better bonuses you get. I love kitty bingo! It is one of my favorite sites to play at. You really can’t go wrong with anything they have to offer. They have a clean layout, which is always a good sign. In addition, new players will also receive a very nice welcome bonus for signing up. After registration players are awarded with a total of £40 in spending cash when you make an initial deposit of £10. They have the basics when it comes to bingo here and they spice things up quite a bit with offers like no limits bingo, guaranteed jackpots and much more. They also offer an exciting promotion when it comes to their slots. Each week, players will presented with a ‘slot of the week’ and will have the chance to earn extra rewards on some of their favorite games. This is a definite plus for me because I spend a fair share of time playing slots in addition to bingo.